There is nothing quite like watching the face of a groom as his bride walks down the aisle to him. Have you ever seen such radiant love? It truly is one of the most beautiful things to behold. You know in that moment how much that bride is loved and desired. It’s no different with Christ’s love for us. Well, actually it is, because his love is infinitely more than any earthly love you’ll encounter. When he looks at you, he looks at you with a love and desire unmatched by anything you’ll ever find here. Did you know that? You are desired. Wanted. Valued. 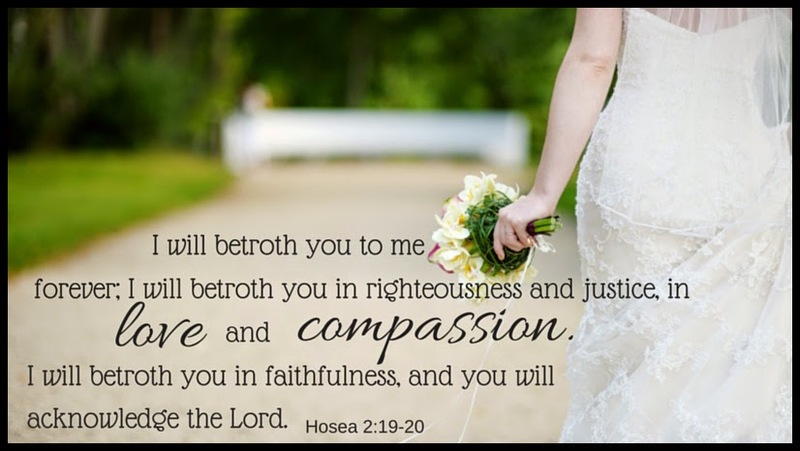 The Bride of Christ. He has such a tender compassion toward you. When he looks at you all he sees is the woman he loves. He doesn’t see our mess, our brokenness, at least not in the way we believe people see it. We think those things mar our value. To Christ, they make him love us all the more. His tenderness desires to heal those places in our lives. His unmatched love desires to make us whole. And when we step into his salvation, he wraps us in the most gorgeous white robes of salvation that rival any wedding gown you’ve ever seen. What a dress to say yes to! Just look at that verse. He wants you for his bride. Today. Right where you are. Father, help us to know that you desire us to be yours. That you accept us right where we are but never leave us there. Allow us to feel your cleansing salvation today, to know we are robed in its white folds and washed clean. Let us see your glowing smile and feel your tender compassion as we acknowledge you as our Lord. Jesus, I want you to come into my life. I acknowledge you as Lord and Savior. I’ve made messes and things aren’t perfect, but you don’t desire perfection, you desire a heart that longs to be Yours. Come into my life today. If you made that decision today, let me know here or inbox me on Facebook. I'd love to chat with you and pray for you! Hello Susan, I had no idea your photo of the bride which I googled would lead me to such an awesome blog. I am so excited now that I have read your article! I recently published a book speaking on this same subject but your narrative is so clear and precious. Thanks for sharing when I actually followed the link to get authorization from the photo's owner to use. Could you consider sharing your blog by linking the photo on my page. Either way, this is BEAUTIFUL!